Minds in Bloom is delighted to welcome Dr. Erica Warren back to the blog today! Dr. Warren is sharing an insightful post about how mindfulness promotes learning, including specific strategies teachers can employ. We know you’ll find this post really helpful, so enjoy! The metacognitive skill, mindfulness, is a gift you can teach your students, and it will serve them throughout their lives. Mindfulness is a state of mind where one is in touch with and aware of the present moment, while maintaining a non-judgmental approach to one’s inner experience. It teaches students how to manage attention, develop resilience, and enhance working memory, and it nurtures greater control over cognition and emotions. In the classroom, mindfulness can be used to improve behaviors, test scores, and confidence, and it can diminish stress, anxiety, and more. What Does the Research Suggest about Mindfulness? Research now supports the neuroplasticity of the brain, and mindfulness helps to form new neural connections, thus changing the structure and function of the brain. These changes are associated with cognitive, social and emotional benefits, and when we can help students reach a place where mindfulness becomes automatic, the plastic change in the mind happens. The brain is most plastic during the school age years, and developmentally appropriate mindfulness-based practices can make a significant difference in the lives of students and their teachers. What’s more, these practices can help to rehabilitate education as a whole (Mindfulness and Learning, 2016). Further research suggests other benefits to mindfulness training. It can halt the loss of working memory during periods of anxiety (Jha, Stanley, Kiyonaga, Wong and Gelfand, 2010), enhance attention (Brefczynski-Lewis. Lutz, Schaefer, Lenvinson, & Davidson, 2007), improve visuospatial processing (Kozhevnikov, Louchakova, Jpsopovic, & Motes, 2009), and can even be used to treat medical conditions (Mindfulness Practices May Help Treat Many Health Conditions). Neuroscience also supports a holistic approach, suggesting that academic learning depends on the integration of social, emotional, and cognitive skills (Barseghian, 2016). As the saying goes, you must practice what you preach. Consequently, teachers must begin by practicing mindfulness in their own lives and setting an example for their students. There are many books on Amazon, as well as YouTube videos, that teach this skill. Once you begin to apply mindfulness in your own life and you feel the many benefits, pass this gift onto your own students by defining and discussing the concept of mindfulness. A great place to start is by watching videos with professionals like Daniel Rechtschaffen and Jon Kabat Zinn. Visualization: Visualization is the ability to create imaginary images within one’s mind. By teaching visualization, you can give your students the tools to improve their overall memory and reading and listening comprehension, as well as writing skills, by tapping into these internal visuals. Metacognition: Metacognition refers the awareness of one’s own thinking – thinking about thinking. It is the ability to manage inner thoughts. This can help students learn to take control of their own cognition. Inner Voice: Inner voice is also referred to as internal speech, or verbal stream. It is a semi-constant internal monologue some people have with themselves at a conscious or semi-conscious level. This can help students manage, guide, and change their inner dialogue to be a positive and motivating influence. When students appear distracted, offer a calming mindful activity. Ask your students to sit for 3-5 minutes with their eyes closed. Tell them to notice their breath, release any thoughts, and relax into their bodies. When their mind wanders, encourage them to refocus their attention on their breath. You can walk them through a guided body scan by suggesting that they start at their feet and slowly work up to their head, asking them to be aware of their body and allow it to fully relax. Before a test, present a mindful activity to students so they can release any anxiety and tension in their bodies. Ask the students to close their eyes and take deep breaths, and encourage them to visualize a peaceful place of their choosing. As they breathe in, have them imagine peace and knowledge filling their lungs and traveling throughout their body and mind. As they exhale, have them imagine that any negative thoughts, such as fear or concern, will leave their body and mind. After a conflict, have the students sit in a circle facing one another. Ask them to close their eyes and imagine that they are one entity. As they breathe in, have them imagine that they are accepting positive energy, forgiveness, and loving kindness into the group. As they exhale, ask them to release any anger or resentment that they may feel. After the activity, ask volunteers to share any kind comments, compliments or appreciation they would like to send to the group or to an individual. Dr. Warren’s Mindfulness Activity Cards were created based on the current research on mindfulness, working memory, social emotional learning, resilience, and metacognition, and they can be used in classrooms or in therapeutic sessions to help enhance learning, confidence, and joy. In addition, they can be used to teach authentic dialogue, to develop emotional intelligence, and to build community. These materials are ideal for individual sessions, circle groups, and classroom discussions. Mindfulness works best when it is scheduled into a daily routine. Remember these activities will only take a few minutes, and it can help your students to develop emotional intelligence, metacognitive skills, compassion, and confidence. What’s more, it will also help to nurture a sense of peace and community in the classroom. I can’t even begin to tell you how mindfulness has changed my own life, as well as my practice. If you too have been using it, leave a comment below and share your thoughts! 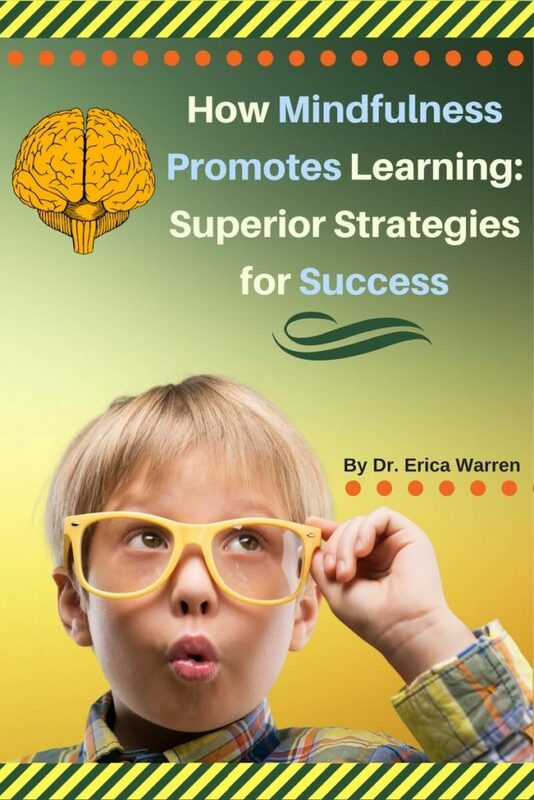 Dr. Erica Warren is a learning specialist, educational therapist, and author of multisensory and mindful educational materials. She resides in New York, where she works one-on-one with students as a “personal trainer for the brain” and as an educational consultant/teacher trainer. Dr. Warren offers multisensory materials at GoodSensoryLearning and Teachers Pay Teachers, as well as courses for tutors, educational therapists, and learning specialists at Learning Specialist Courses. You can read her popular blog here. love, love LOVE the end of year task cards.I am asking my gr. 3/4 students to one card from the single digit cards, one from the teens and one from the 20’s for each week of June. Much appreciated!